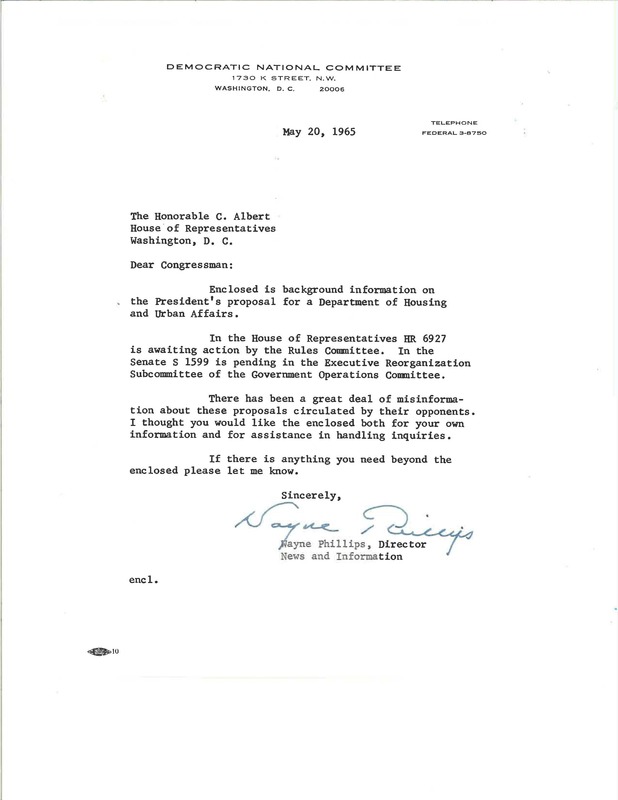 Letter by Wayne Phillips, Director of News and Information for the DNC, with an enclosure outlining background information on the proposal for a Department of Housing and Urban Affairs. TL from Albert thanks the Director of News and Information for the data. Albert, Carl, 1908-2000. "Correspondence exchanged between Wayne Phillips, Director of News and Information for the DNC, and Carl Albert." Original Correspondence. Letters exchanged by the Director of News and Information of the DNC Wayne Phillips with Rep. Carl Albert. Carl Albert Congressional Papers, Legislative Series, Box 87, Folder 28, Carl Albert Center Congressional Archives, University of Oklahoma. Accessed 25 April 2019. http://acsc.lib.udel.edu/items/show/281.